Unknown, Robert McNabb Waddell, Mary Hume Waddell nee Thomson, Minnie & Burt taken in June 1935. 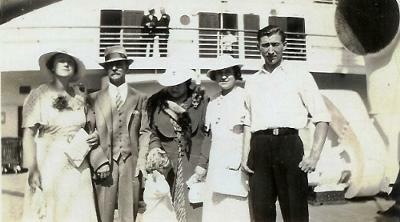 On August 15, 1919, after travelling by train from their home in Edinburgh, the Waddell family departed Liverpool, England aboard the SS Melita for Montreal, Quebec, Canada. They arrived in Quebec City on August 22, 1919 to continue the journey by train. Robert McNabb Waddell, a carpenter was born in Edinburgh, Scotland on January 6, 1884; his wife Mary Hume Thomson was also born in Edinburgh on September 17, in the same year. They came to Canada with their three Edinburgh born children: James John Waddell (Jim) born October 4, 1907, Marion Robertson Broadfoot (Minnie) born October 19, 1909 and Robert McNabb ‘Jr.’ (Burt) born November 12, 1912. Robert was a carpenter by trade, and a bag pipe major with ‘The Royal Scots’ in Montreal. 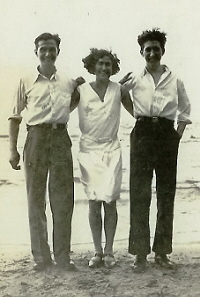 Jim, Minnie and Burt, the three children of Robert McNabb Waddell and Mary Hume Thomson all were born in Edinburgh and moved to Montreal in 1919. Photo taken July 1930. 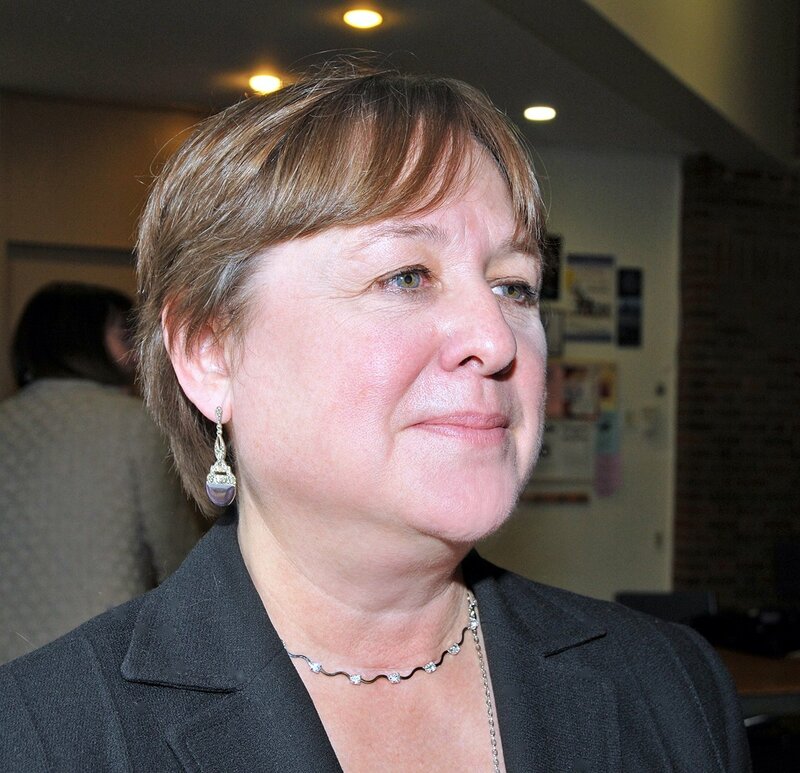 Their first residence was 2385 Davidson Street. 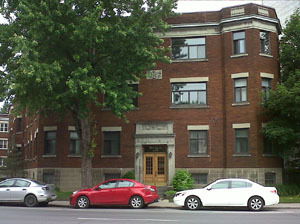 Robert and Mary eventually purchased the apartment building at 4278 Sherbrooke Street West, (shown below) where they lived until his death on February 23, 1959, and her death on July 29, 1963. Jim Waddell married Jane Mickelson McDonald (Jean) at Maisonneuve Presbyterian Church on August 8, 1931. Jean was born in Gourock, Scotland immigrating to Canada aboard the SS Antonia on September 7, 1929. She died in 1949 at the age of 38. They had one daughter, and three grandchildren. Jim was part of the RCMP Reserves in Montreal. He ultimately moved to Richmond Hill, Ontario where he married Lee, and resided until his death on April 10, 1990. He was 82. 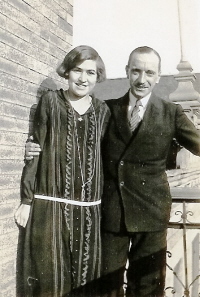 Marion Robertson Broadfoot Waddell in 1927 with George Gould who became her husband in 1931. Minnie Waddell married George Gould at Maisonneuve Presbyterian Church on November 28, 1931, George was born in Greenock, Scotland on December 15, 1904, and immigrated to Canada on the SS Melita on July 17, 1931, retiring from a 15 year career at sea travelling between Glasgow and Montreal on the SS Montrose. Minnie worked at Bell Canada as a telephone operator until her first pregnancy began to show, up to that point she kept her maiden name and did not tell anyone she had married, as married women were not allowed to work at Bell Canada because it was perceived that ‘a married woman first duty was to the care of her husband and therefore unable to focus on a job’. George and Minnie moved to Toronto where they had a son and daughter, and four grandchildren. They purchased a house in the beaches in Toronto for $800.00 where they raised their children and daughter still resides. George died shortly after their 55th wedding anniversary on his son’s birthday, May 25, 1988, Minnie lived to her 100th year, passing away in April, 2009. Burt married Alice Mary Perrault on April 16, 1955 in Montreal. Little is known about Alice but we believe she was born in Montreal in about 1912, and she died shortly after 1963. Burt lived to July 16 1982, residing at the apartment building his parents owned on Sherbrooke Street, as it was left to him in his mother’s will. Robert McNabb Waddell’s ancestry is traced to about 1735 in Shotts, Lanarkshire, Scotland, as follows: James John Waddell, born March 12, 1848; William Waddell, born March 20, 1814; John Waddell, born December 17, 1777; James Waddell, born about 1735.